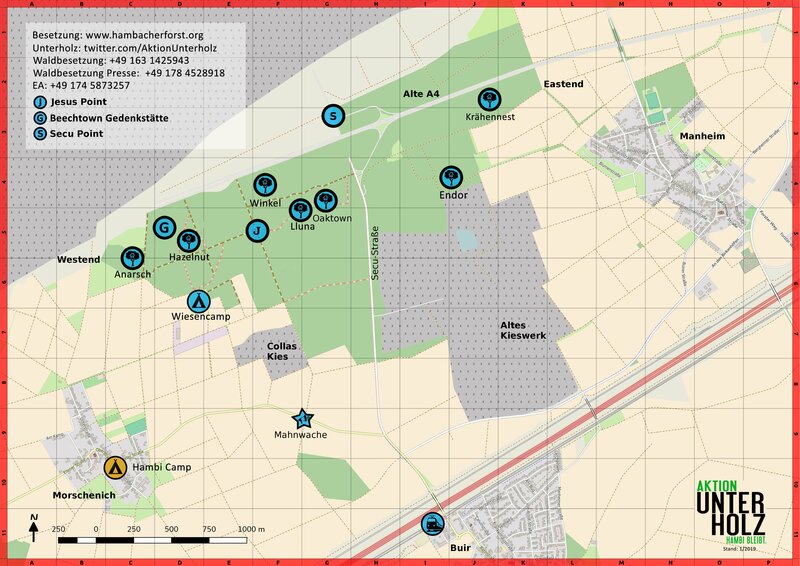 This is the updated action map of (almost) all barrios in Hambach Forest. To use it by yourselves, to print and to forward to others. Click on it to see it full size. Nightly Police Violence. An activist reporting what happened to him. UPDATE: Meanwhile, this year’s deforesting season has been banned by the Oberverwaltungsgericht (Higher Administrative Court) in Münster, a couple of days after this speech. Suddenly, the presence of police “for security reasons” does not seem to be necessary anymore. Of course, that has nothing to do with each other. For 16 days the police has been clearing the occupations in Hambach Forest. Forest-walk this Sunday (23rd September), or any day! Every person has a right to experience nature, see the trees, feel the leaf-covered ground under their feet, and hear the calm ambiance of the forest. However, in the 12,000 year old Hambach Forest, the police are making it hard for nature-lovers young and old, to do so. 18:00 Hambi Bleibt! Demo in Frankfurt, Kaisersack, ab 19:00 Mahnwache mit Aktionen am Willy-Brandt-Platz. Falls eure Veranstaltung hier aufgeführt werden soll, bitte eine Mail an hambacherforst@nullriseup.net schreiben. The EA (legal team) is available 24/7, +49177 1897053. Get in touch if you stick in a check or in custody, observe police actions or need legal advice. And always let us know when you’re out again! There are some persons in prison at the moment. More info. The polices forces of NRW have currently begun the eviction of treehouses in the Hambach Forest occupation. They will now be violently removing activists and destroying the infrastructure of the occupation, in order to prepare for RWEs continued clearing of the 12.000 year old Hambach Forest. In this way Herbert Reul (CDU), interior minister of the state of Northrhine-Westphalia, is actively attacking climate justice and democratic civil rights, in support of fossil-fuel giant RWE and the coal-lobby, clearly showing the corruption inherent in the capitalist system. With the eviction of the first tree houses, the Hambach Forest occupation, alongside several action-alliances (including Ende Gelände, Aktion Unterholz, and Buirer Für Buir) are calling out: Day X is here, and a new phase of the struggle has begun. In the next days, while RWE employees, with support from the hired soldiers of the German state, attempt to evict the occupation, hundreds of people will join the forest struggle, in order to protect the climate justice protest-camp, and there are many ways to take part. See the text “How do I become active?” for more information.